With so much focus on the Irish heroes of Italia 90, we sometimes forget about the 'muppets'. They were a sizeable group of the travelling party that jetted off to the southern islands of Italy but never really enamoured themselves with the Irish public in the same way as the Packie Bonners, Dave O'Learys or Niall Quinns. They trained hard in the searing heat, got involved in the horseplay that galvanised the squad and were always up for Ching Ching - a game "where naked birds held up cards" - to banish the boredom in the pre-World Cup training camp in Malta when the team were sent to a hotel that was shut down with the Irish contingent the only occupants. The muppets - a phrase coined by the nine players who didn't feature in any of the games in Italy - were very much part of the Ireland squad in 1990 and it's from these humbling beginnings that Niall Quinn blossomed to become an unlikely hero against the Dutch. 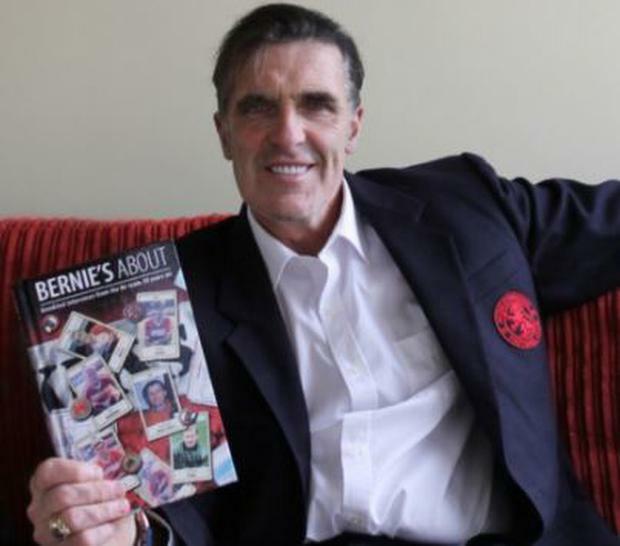 Bernie Slaven was a 'muppet'. He scored on his Ireland debut in a friendly against Wales 27 years ago today (March 28, 1990), was top scorer in the old English Second Division in 1990 and became the first-ever Irish player to score a Premier League goal when he notched against Manchester City in the inaugural season in 1992. 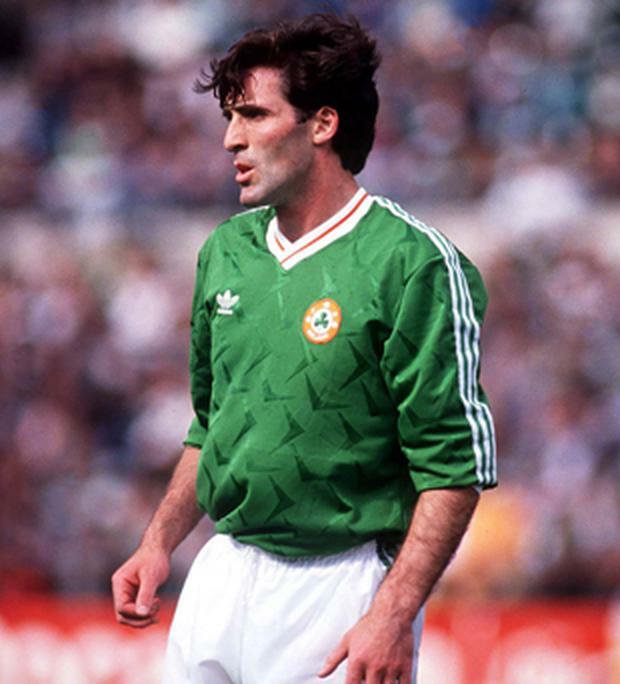 He was the original 'bolter' and featured in just three friendlies to "sneak in the back door" and book his place on the flight to Italy but with no game time on the pitch, Slaven's defining moment from Ireland's maiden World Cup voyage was highlighted in Tony Cascarino's autobiography. Cas revealed that Slaven missed his dogs so much that he called home every evening to 'speak' to them. "He would be howling like Lassie into the phone 'Woof, woof, aru, aru, woof!' He'd be kissing the receiver and lavishing affection – 'Hello, lovey dovey'," wrote Cascarino. "The reason I spoke to the dog is because you got more sense than the missus, what's wrong with that?" Slaven tells Independent.ie. "I don't know what all the fuss is about. The PC brigade will be up in arms but I don't care. "I used to say 'put the dogs on the phone'. Sean was his name, an Irish setter. These days I have two Irish setters." Slaven was a colourful character who wasn't afraid to speak his mind and this led to a couple of high-profile spats with managers and a famous Monday in Middlesbrough when over 3,000 people turned up to see his bum in Binn's department Store in the town centre. His rise to the Ireland set up was meteoric and his desire to stay there palpable. "Was I hoping to get on the bench at least? Yea I think I was. There were nine of us out of the 22 who never got a game and we classed ourselves as the muppets. It was a bit of a joke behind the scene, the muppets against the first team," he continues. "We were training in searing heat and the lads that didn't train were still super fit. Jack was very strict. 'You don't sunbathe unless I give you the nod and you don't drink unless I give you the nod', is what he would say. "The lads knew not to mess about with Jack. Jack was the only manager I ever played under who could be your mate, have a drink and a laugh, but when he was your manager, he was your manager. "I have never known that. You are either a good guy or a bad guy but Jack could be the good guy and then unbelievably ruthless. "I look at Ireland and I think I was as fit as a butcher's dog then. I didn't drink, I didn't smoke, gamble..I still look after myself now. I wasn't given a great opportunity. Jack told me I would be in the squad for three years and I was in it for three years. "These guys had gotten to the Euros and I came in the back door. I get that totally and Jack was loyal to the players who did the business for him. It was frustrating, of course it was. But there were guys like Frank Stapleton who scored 20 odd goals for Man United. When I joined up he was sort of in the wilderness as well. "Ronnie Whelan picked up an injury in the World Cup and his game time was limited, Liam Brady was left behind. I came in the back door." Sheedy's left-footer daisy cutter against England, Packie Bonner's save from Daniel Tifomte's penalty, David O'Leary's calmness as a nation held it's breath. The World Cup in Italy threw up numerous moments that Ireland has built a footballing legacy on. It was Niall Quinn's outstretched right leg against Holland that ultimately secured a passage out of the group and into the last 16 against Romania, a goal that was very much made on the training ground. "I had never seen it done. Before the Holland game and it was the muppets against the starting 11 behind closed doors and the ball was played up to Tony Cascarino and Cas' touch was letting him down and he miscued his header," reveals Slaven. "Jack said 'listen, get your act together'. Then Cas had another bad touch and Jack was like 'I'm telling you, I'm warning you, get your act together'. "Jack lost it and said 'go with the second string. Niall (Quinn), you go with the first team'. Niall scored against Holland the next game. I had never saw someone getting changed in a training game." Subtlety was never a trait associated with Charlton. A non-nonsense, one-dimensional tactical approach on the pitch was mirrored by his abrasiveness off it. Off the field, his mannerisms were pivotal in persuading second generation Irish to join the green revolution, including Slaven. "I went to see Newcastle United playing Blackburn Rovers. Stuart Ripley was playing for Blackburn. I went up with (Gary) Pallister to get tickets at the ticket office, I had been saying things in the paper (about Scotland)," Slaven adds. "Jack (Charlton) was at the front of the queue getting his tickets and he turned around and he looked at me and said 'I hear you have Irish grandparents. You hang fire now and I'll cap you against Wales'. Pally sorted of looked at me and he (Charlton) just headed off, he just walked off. "When I got back to training, Bruce Rioch told me Jack Charlton was going to phone me at 1pm. Jack was interested and put his cards on the table. I spoke to my late father who was a massive Celtic fan. "He said 'look, you went to England to ply your trade, you were Scotland's top scorer and no clubs came in. You owe them nothing and you are probably better off going to the Republic and they are a better outfit'. It was the right choice." Slaven only had three friendlies in which to impress before Charlton finalised his Italia 90 squad but that wasn't the only stumbling block as it soon became apparent that new Boro boss Colin Todd wasn't exactly fully supportive of his man's ambitions to cut it at international level at the age of 29. Hurdle one was cleared emphatically. "I remember rounding Southall on the outside right position, hitting it and it was going in but one of the defenders parried it around the post illegally. I was hoping to take the penalty but Kevin Sheedy stepped up, an experienced international. No complaints about that because I wanted to win the game," says Slaven. "I remember Sheedy going up, placing it and the keeper reading it, Southall was a great keeper. He parried it and I anticipated it and I hit the rebound and I remember going behind the goal and celebrating with the stewards and fans. "I only had two-and-a-half or three games to get in the back door and go to the World Cup and one of the games I missed through manager Colin Todd (Boro manager at the time after Bruce Rioch left). He made me play against Nottingham Forest on a Tuesday night and I missed the Republic game. "That happened a couple of times with me. Lennie Lawrence, who I never got on with, he stopped me playing a game after the World Cup. He postponed a game for one of the English lads who was going to get a B cap or something. "It was an injustice. How can you cancel a game for an England B cap and not for a full international? On a couple of occasions that was evident and I didn't like that. I was running out of time at 29 to go to a World Cup." A couple of weeks ago we were treated to the great man, Paul McGrath, on the Late Late Show and true to form on old Italia 90 story was regaled. McGrath talked about how Charlton ordered in kegs of Guinness a couple of nights before the World Cup quarter final with Italy and the players began a game that involved cracking spoons off people's heads. Hardly your conventional or professional approach to a game of such magnitude but then again neither was a Harry Ramsden's Challenge, barbeque with the media or pizza. The anecdotes and stories from the Charlton era have become the stuff of legend. Maybe it was the fact that Slaven didn't drink and while he recalls a spirited atmosphere in the camp, beer-guzzling tales and bar games are not something that resonate with him when thinks back to Ireland's campaign that saw us bow out in the quarter-final stage to a Toto Schillaci goal against Italy. "There was a lot of boredom, not so much the tournament itself. It was in Malta acclimatising for about 10 nights. We were in a hotel that was shut down and it was only open for the players," remembers Slaven. "That was boring. The highlight every night for the Irish players was a game called Ching Ching which was naked birds holding up cards. We used to say we are going up to see Ching Ching, that's how sad it was. "In Italy, without doubt there were characters and the usual horseplay. I got that as well because when you are a professional player that's what happens. "Whether it was a phone call in the middle of the night. Or in the World Cup, I remember knocks on the door and me and Alan McLoughlin were lying on the bed and a couple of lads ran in with buckets of water and chucked them over us. "Andy Townsend, Ray Houghton were good mates and were fun guys. Big Packie was funny but serious at the same time. There were some great guys there, Chris Hughton. 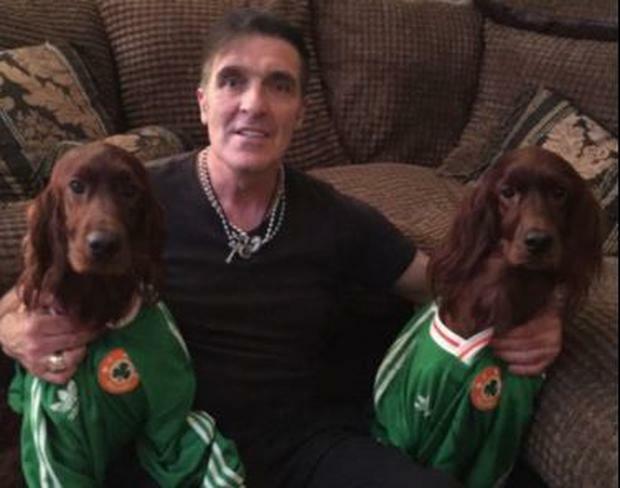 "I remember getting my picture taken with Mick McCarthy in Sicily beside a fountain. As he sat down beside me he put his arm around me and I ended up in the fountain. I loved Mick, he was straight as a die. No messing. He would never say anything about you, he would just tell you straight. "I never saw big drinking going on. I think we were allowed it one night in Malta because we trained very, very hard. The next one was after we got knocked out in the quarter finals which we were entitled to." Slaven looks back on his brief Ireland career with no regrets. He lived every footballer's dream of going to a World Cup and did so for a country that his steeped in his family tradition. Both sets of grandparents are Irish with his dad's father hailing from the Gaeltacht village of Bunbeg, the smallest townland in Gweedore and a place where Slaven still has land. 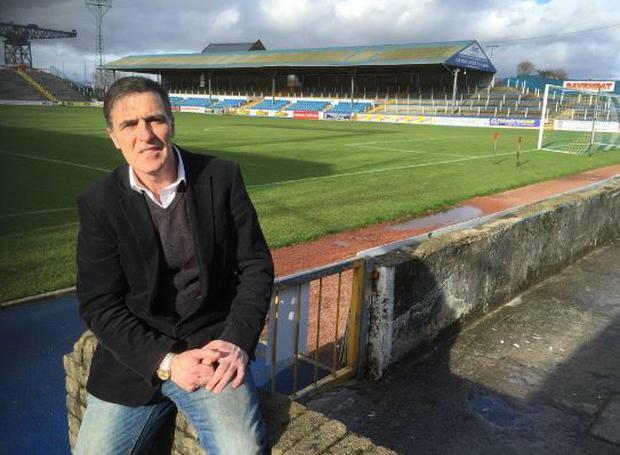 "I used to watch Scotland as a boy. As I became an adult I didn't go much because my father didn't go," says Slaven. "When Scotland used to play England, as much as I hate to say it, he would admire how England zipped the ball around. I would like to think he was a football connoisseur. This was back then they were a good team, they are crap now. "He used to try and educate me on good football, he wasn't a Scotland fan. Did I feel Irish? My grandparents were genuine Irish, steeped in Irish history. I actually went and visited an uncle who I had never met through football, I have a bit of land over there that I still own and my cousins who are based in Glasgow, they are staunch Irish. They are back there every couple of months." Today Slaven is involved in a soccer academy he set up with Curtis Flemming, Gary Pallister and Craig Hignet and still writes books about the history of Middlesborugh. Following a career that saw him score 147 goals in 382 appearances, Slaven spent time covering games for the club on his own radio phone in show with legendary commentator Alastair Browlnee and this provided the platform for one of his more infamous off-the-pitch moments in 1999. "We were doing a phone in after the game at the Riverside and Alastair Brownlee turned to me and said 'next week we go to Old Trafford, the Threatre of Dreams. How far would you go if we actually beat them'? "There is a saying in Middlesbrough that you show your bum in Binns Window. So I asked when was the last time Boro beat Man United and he said it was 68 years ago. "So I said 'I'll tell you what, I will show my backside if we win'. He went and had a word with the manager on the Monday morning, the match was the following Saturday. "Got to Old Trafford and we were 2-1 up and thousands of Boro fans were singing 'Bernie Bernie show us your arse'. "All the national press got a hold of this and came over at half time wondering what was going on. 3-1 up and I have got a sweat on at this stage. 3-2 and in the dying minutes there is a ball over the top to Andy Cole. I'll be honest inside I am thinking 'score the goal Andy, 3-3 is a good score at Old Trafford and gets me off the hook'. "He missed it and on the Monday morning I go into the store and the manager has a sweat on. Within half an hour the room was full. The police came in to make sure I had underwear on. It was about 10-15 deep in the store as I walked towards where I was to go and there were grannies lifting my kilt and squeezing my cheeks. "I get to the window and the shutters were down. I was thinking 'well everyone is in here'. As soon as the blinds went up there were over 3,000 people outside looking in." Slaven admits he still keeps a keen eye on Ireland’s progress but don’t expect any similar forfeits should Martin O’Neill’s men make it to Russia for next year’s World Cup. What became of Jack's boys in green?